Quinn was sweet enough to drive all the way to Colorado in July with me to attend one of my old choir and track buddies wedding. My highschool friends are finally starting to get married, they all thought I was CRAZY when I tied the knot two years ago, now they are finally seeing the light! I have known booth the bride and groom since elementary school, so it was great to see them get hitched! Plus, Quinn and I were able to visit my parents and hang out with the younger siblings. The wedding ended up being like a high school reuion of sorts. It was so weird to see all the people that I grew up with again (it has been almost 5 years). A lot of the people that were in Summit Singers (a select choir in my high school) including the bride and groom were at the wedding. We decided to sing a little song for the newley weds, for old time sake. It tunred out, that we had our pianist, our choir teacher, several tenors and bases, 2 sopranos, and me...the lone alto. Just enough to pull off an impromptu performance. In June Quinn and I were able to go to Boston... on the compnay dollar (at least my part of the trip was). Tandem Labs (my current employer) had a tradeshow in Boston that I put together; so of course, I had to go. I thought to myself, why not turn a business trip into a vacation and invite Quinn along!! We had a awesome time sleeping in a 5 star hotel, eating fresh seafood, and enjoying the sites! Quinn was in Heaven all morning (it happened to be 10am when we got there). Nothing like award winning ribs for breakfast! 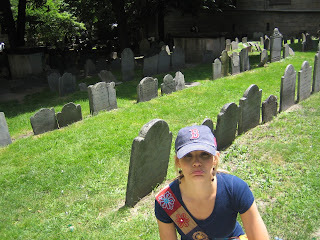 Bunker Hill Cemetary...I felt weird smiling around a bunch of dead folk! You can't go to Boston without visiting historic Fenway!! I also must say...Flirting is sooo underrated, how else are you supossed to get 10th row seats when you were supossed to be sitting in nosebleed? 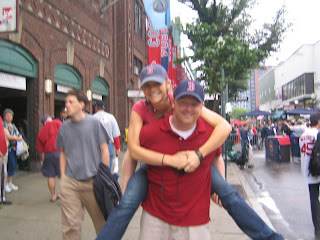 A Fenway way park must...Sweet Caroline! No ballgame is complete without this song. Our final destination after our 20 mile bike ride around Nantuckett Island. 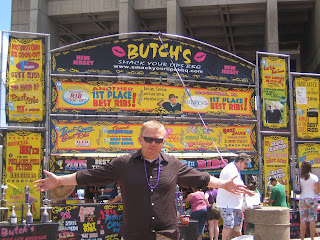 And yes...we were SOO sore the next day! 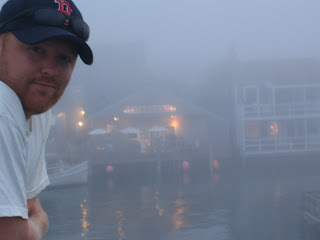 Just as the ferry was leaving Nantuckett to take us back, a dense fog rolled in. It made the whole island look like a ghost town and the temp. drop about 40 degrees!! 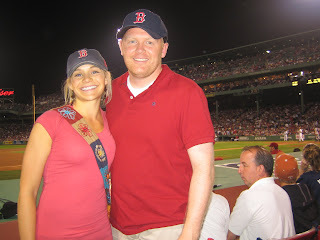 We loved Boston, I would move there for the Gelatto and Canaloi (italian pastry that I may have been OBSESSED with!) We can't wait to go back again!